Self-Assurance is similar to self-confidence. In the deepest part of you, you have faith in your strengths. You know that you are able -- able to take risks, able to meet new challenges, able to stake claims, and, most important, able to deliver. But Self-Assurance is more than just self-confidence. Blessed with the theme of Self-Assurance, you have confidence not only in your abilities but in your judgment. When you look at the world, you know that your perspective is unique and distinct. And because no one sees exactly what you see, you know that no one can make your decisions for you. No one can tell you what to think. They can guide. They can suggest. But you alone have the authority to form conclusions, make decisions, and act. This authority, this final accountability for the living of your life, does not intimidate you. On the contrary, it feels natural to you. No matter what the situation, you seem to know what the right decision is. This theme lends you an aura of certainty. Unlike many, you are not easily swayed by someone else's arguments, no matter how persuasive they may be. This Self-Assurance may be quiet or loud, depending on your other themes, but it is solid. It is strong. Like the keel of a ship, it withstands many different pressures and keeps you on your course. Realize that sometimes you will find it hard to put your certainty or intuition into words, possibly leading others to see you as self-righteous. Explain that your certainty does not mean that they should withhold their opinions. It might not seem like it to them, but you do want to hear their views. Your certainty at the moment doesn't mean that you are unwilling to accommodate their views. 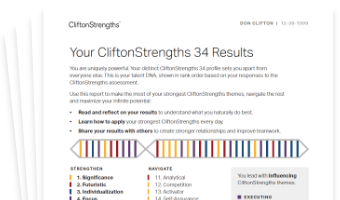 See how Self-Assurance shows in your CliftonStrengths results -- discover All 34 CliftonStrengths Themes today!